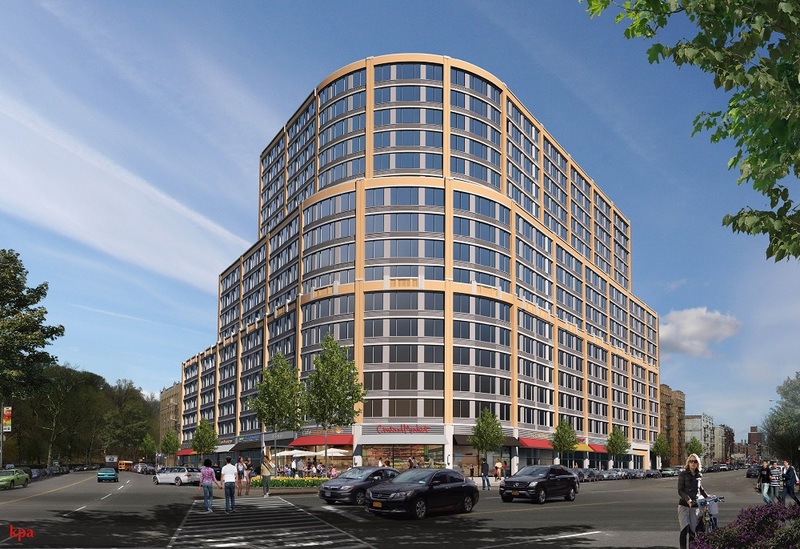 In a sharp rebuke of Mayor de Blasio’s affordable housing plan, the city council voted down a zoning change that would have allowed a 15-story development on a prime corner in the northern Manhattan neighborhood of Inwood. The council’s August 16 vote followed a decision earlier in the day from the Committee on Land Use, which voted against a proposed rezoning brought forth by Washington Square Partners, the developer of Sherman Plaza, a mixed-use structure designed by New York–based Kenneth Park Architects at 4650 Broadway. Sherman Plaza was slated to be the first individual development zoned for Mandatory Inclusionary Housing (MIH), a key provision of the mayor’s plan to build or preserve 200,000 units of affordable housing over the next decade. The development would have offered 20 percent of the units at 40 percent of the area median income (AMI) or 30 percent of units at 80 percent of the AMI, which in 2015 was $86,300 for a family of four. Residents believed that the development’s affordability was not deep enough for the neighborhood. The community is now mostly zoned R7-2, a moderate density designation that encourages five- to eight-story structures with generous street setbacks. The proposed change would have established a higher density R8X and R9A district plus a C2-4 district within that R8X-R9A district at the corner of Broadway and Sherman Avenue.The City Planning Commission (CPC) approved a proposed rezoning of that site that would set a height limit of 175 feet. Residents praise the architectural character of Inwood’s art deco apartment buildings. The neighborhood’s features, though, are conditioned by height factor zoning: The FAR is tied to the height of the building, so tower-in-the-park–style buildings have larger setbacks and a higher FAR, while shorter buildings earn a lower FAR and sit closer to the curb. The project caught heat in the lead-up to the August meeting from residents and civic groups concerned about its impact on the neighborhood. Sherman Plaza was originally conceived as a 23-story, 375,000-square-foot development with 350 units and ground floor retail. In May, Community Board 12 quietly okayed the plans without alerting residents. The Municipal Art Society testified against the development at a City Planning Commission meeting that same month, citing its high affordability thresholds and out-of-context aesthetics. Neighbors were worried that, because of the sloping topography, Sherman Plaza would plunge adjacent Fort Tryon Park into shadow. At the committee meeting, Rodriguez explained his position before voting down the proposed rezoning: “I was listening to the community for months. It’s important to preserve the landscape of the community.” He added that under Mayor Bloomberg, only 250 units of affordable housing were added to the neighborhood, and that many renters, his household included, receive preferential rents that could increase dramatically if Inwood’s housing market heats up. Council members from the Committee on Land Use and the Subcommittee on Zoning and Franchises followed Rodriguez’s lead to vote 15-0 in opposition to the rezoning. Council members traditionally have first pass on developments in their district, and other members defer to the decision of the official from the affected district. Community activists from an array of local groups in the room cheered the committee’s decision. Donovan Richards Jr., chair of the Subcommittee on Zoning and Franchises, offered a thinly veiled rebuke of Rodriguez’s position. “It’s very easy to say no, it’s harder to build consensus on land-use issues,” he said. including Rodriguez—who oppose MIH developments in their neighborhood. A spokesperson for the developer said her client was “surprised by how much attention” Sherman Plaza received, but noted that next steps for the project are under wraps. WNYC reported that Washington Square Partners may move forward with a plan that includes no affordable housing. Inwood resident and architect Suzanna Malitz applauded the committee’s decision. While Malitz and fellow members of Uptown for Bernie in attendance opposed Sherman Plaza, she supports contextual development east of 10th Avenue along an industrial strip that fronts the Harlem River. There’s “plenty of space” there for denser developments that include affordable housing, she explained. Rezoning this area is a top priority of the Inwood NYC Neighborhood Plan, a coalition of city agencies, nonprofits, and community groups working through the New York City Economic Development Corporation (NYCEDC) to envision the neighborhood’s future growth, with an eye towards developing the largely industrial areas east of 10th Avenue. Although the plan’s study area extends north from Dyckman Street and doesn’t include Sherman Plaza, if realized, its key provisions will most likely affect surrounding areas, the Bronx included. New York–based Studio V collaborated with NYCEDC to make the vision more tangible. “Inwood is extraordinary. It has unique conditions—the grid shifts between the east and west sides, it’s bounded by two rivers, and has old growth forests in Inwood Hill Park. There’s a huge opportunity to develop the waterfront along the Harlem River and Sherman Creek, so the area goes from being an edge to being a center,” said Jay Valgora, Studio V’s founding principal. The firm’s renderings show an array of towers that could be developed on both banks of the Harlem River if the east side is upzoned. The east side can support greater density without cutting into the neighborhood’s beloved deco fabric, Valgora explained. Cheramie Mondesire attended NYCEDC-led meeting but was dissatisfied with the proceedings. At the second meeting she attended “it was all scripted. They couldn’t answer questions that were not on the script.” The Metropolitan Council on Housing was there to organize residents, and Mondersire, who has lived in the neighborhood for 42 years, attended their meetings to learn how MIH could be applied in Inwood. She agreed that the area east of 10th Avenue would be better suited for dense development than the middle of the neighborhood’s fabric. State assemblymember Guillermo Linares opposed Sherman Plaza, noting that developments like these accelerate the process of gentrification. “You see what happened in lower Manhattan and Williamsburg. In my district, there’s a high concentration of low and middle-income families who cannot afford the housing that’s being built.” Linares cited Sherman Creek as a potential area for “100 percent affordable housing” that includes ground floor retail to enliven the streetscape.